David Miller from the Urban Leadership Institute joins us for a discussion about coping with losing a loved one through inner city violence. 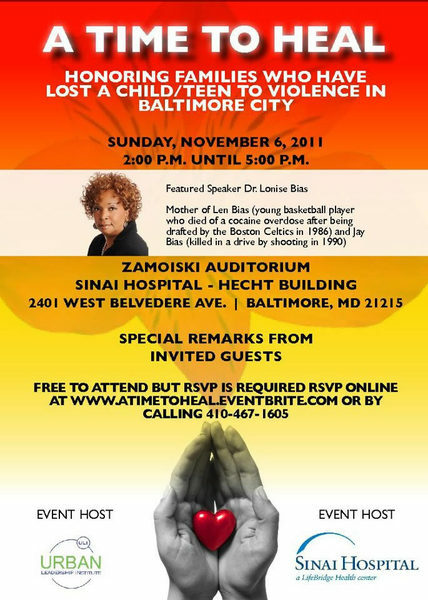 He will be hosting A Time to Heal, this Sunday, November 6th, for families who have lost children to violence in the city. Also joining the show are Elwood Conway, a trauma nurse at Sinai Hospital, and Dr. Lonise Bias, who lost her son Len to a cocaine overdose and her son Jay to a drive-by shooting. Dr. Bias will be the keynote speaker at Sunday’s event.